Ever wonder what would happen if Cinderella’s Fairy Godmother went on vacation? In Madcap’s twisted take on the classic fairy tale, it’s up to her husband, Ralph, the Fairy Godfather, to get Cinderella to the ball. With help from the audience, giant puppets and the big wand, Ralph might have a chance. 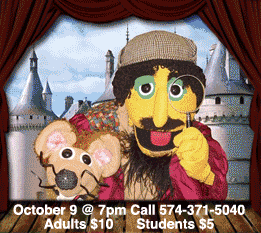 The Madcap Puppets presentation is at 7 p.m. Wednesday, Oct. 9, at the Warsaw Performing Arts Center at Warsaw Community High School. Tickets are $10 for adults and $5 for students. Call 574-371-5040 for tickets.